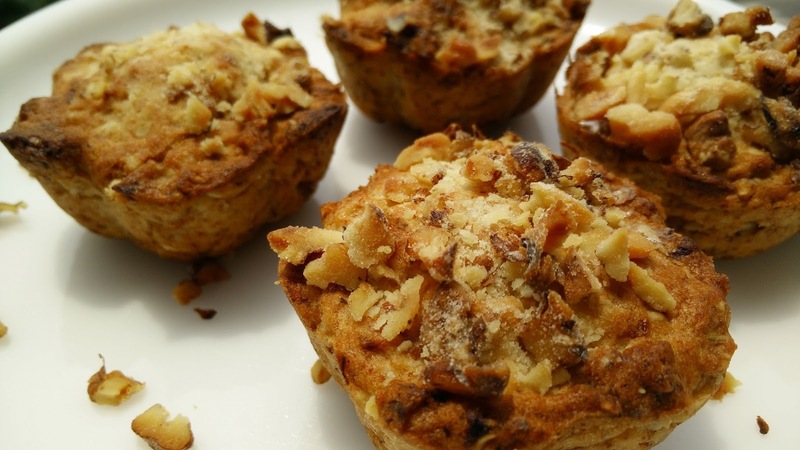 This is a very healthy high fiber muffin which can serve as a tea time snack or dessert recipe. It is so simple that even kids can make these and will feel really happy to bake muffins. Try decorating these muffins with candies or any other kids stuff. 1. Mix butter and sugar together and add mashed banana and walnuts. Mix well. 2. In separate bowl, mix refined flour, oats and backing powder. Add these dry ingredients in the above mixture and cut and fold the mixture 3-4 times. 3. Add little milk if the batter seems to be very very thick. But in general this batter will be thick. 4. Grease muffin mould and put the muffin batter in each mould. Some walnuts can be put on top of each mould as well. Bake these muffins in preheated airfryer at 160 degrees for 10 min. Once baked, keep muffins in standby time for another 10 min. Take out all the muffin mould and allow to cool down for 10 min. Once cooled, de-mould all the muffins and serve.